July 12th, Loudon, NH: Global RallyCross -GRC makes a one day stop at New Hampshire International Speedway for round number 4 of the 2013 Championship. After coming off one of the best course layouts to date for the GRC in Munich Germany, it was for the most part back to where we were last year with a course layout that used over 70 % of the Loudon Speedway track, which I have to say can get mundane at times as the gap opens on the long straights. For 2013 the metal gap jump has been nixed for many good reasons, but unfortunately it was replaced at the Loudon configuration with a dirt hill, that wanted to be a table top jump, problem was, based on its placement to the chicane the cars couldn't get enough traction in the dirt to get any proper air. All that been said, the transition from the starting asphalt into the dirt section, then directly into a chicane was definitely the highlight of the track. One point that I must make, although the U.S. GRC track layouts pale in comparison to those in Europe, Americans who are new to European style RallyCross find this extremely exciting racing when compared to Nascar! Enough said. Ken Block and his Hoonigan Racing Team’s Ford Fiesta set the mark throughout the heats, Block posted the fastest time of the day, netting him the starting position of his choice. Toomas “Topi” Heikkinen, of OlsbergsMSE/Ford Racing who was also driving a Ford Fiesta ST, took second with Tanner Foust of the Rockstar Energy /Ford Racing posting the third fastest making it an all Ford front row. Into the final, typically the prime lane choice is on the inside of the first corner, for whatever reason Ken Block would select the middle starting position therefore giving Heikkinen who had the second fastest time the option for the inside line, and he took it!. Maybe Ken was thinking of last year where he got driven in the tire wall on the start, or just felt more comfortable with the launching from the center position, who knows, but I have to think he is reevaluating his starting position today. 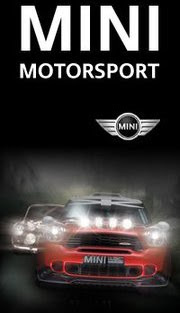 Tanner Foust would line up to Blocks left. Swedish Rally driver, Patrick Sandell [Ford Fiesta], Norway’s Sveere Isachsen[Subaru STI] and Brian Deegan [Ford ] would make up the second row. The third and final row would see Travis Pastrana in the Dodge Dart, scrapping his way into the final via the LCQ lined up with Scott Speed [Ford] and Bucky Lasek in the second of the Subaru’s to make the final. When the lights turned green, Heikkinen seemed to get the better launch nosing just slightly ahead of Ken Block, but Ken would made up the difference by the end of the straight, but Block would lift/brake just before entering the gravel section letting Tanner and Heikkinen past on both sides. There is no question that Ken Block will fight you to the tooth and nail on any rally stage in the world, and has shown massive skills in his Gymkhana series of videos. But when it comes to RallyCross Ken is just a little too much of a gentleman, he needs to follow the lead of Heikkinen and the likes of Liam Doran into the first turn, if a headlight fits, push on into the turn. As the cars climbed the dirt hill [sorry can't call it a jump] for the first time, it was Foust, Heikkinen, Sandell and Block, with Deegan breathing down Block’s neck. Coming off the dirt hill drivers had the option to take the mandatory joker lap, or drift out onto turn one. From there it was down the front straight [counter to normal track direction] through a chicane before braking hard for the unique “over the wall” ramp constructed at the Magic Mile. Once over the wall they would head down the same straight, to start the cycle of remaining 9 laps [total 10]. Travis Pastrana’s GRC season would go from bad to worse when the rear of his car slide off the ramp on the first lap resulting in a rear flat, Pastrana would push on, but his race was over, no returning to the pits in GRC. With a clear track ahead, Foust would make hay and open his lead on Sandell who was battling to hold off his teammate Heikkinen for second. Ken Block and Deegan were door to door until Block opted for the early Joker giving up the position to Deegan. Unfortunately a little extra drift by Block in the joker would also let Bucky Lasek in the Subaru slip through. The racing up front would space out some until Foust took his Joker lap, which let Sandell get on Foust’s rear bumper sliding out of turn one, but Tanner held the line and the lead. Down to the penultimate lap, Heikkinen was still hounding Sandell for second, as the pair crested the dirt hill Sandell would opt to take his mandatory Joker, opening the door for Heikkinen to try and close the gap to Foust. 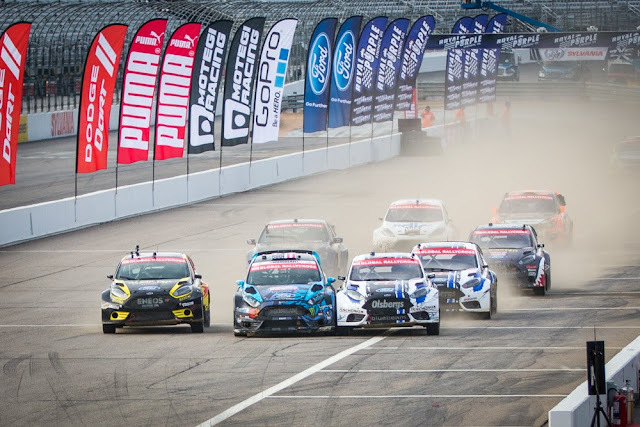 Toomas Heikkinen has quickly become the force to be reckoned with in the 2013 GRC championship, coming off the victory in Germany, Topi was clearly looking for a repeat victory in Loudon as he charged all out in his pursuit of Foust on the last lap. As Foust entered the dirt section for the final time, Heikkinen had somehow closed the gap on the Rockstar Energy driver. 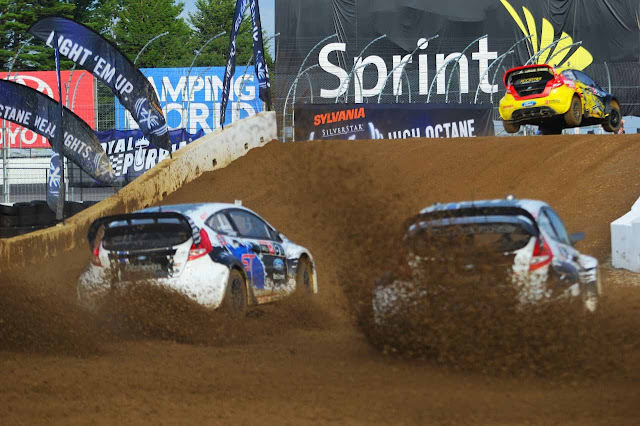 Heikkinen would pile on the pressure on Foust as the charged front straight for the final time. Tanner would try to protect the insider line as he entered the over the wall ramp, but that’s where it all went wrong for Foust. Tanner would get off the racing line and get into the loose gravel on the inside, resulting in a spectacular wreck into the guard rail. With Foust up against the guardrail Heikkinen slips through on the final turn to grab the victory, Brian Deegan who had overhauled Sandell would now move to second, Sandell would also get by Foust’s crippled car for third. Tanner would manage to get the car re fired and hobble across the line in forth just ahead of Ken Block. “I think it was difficult for everyone”, noted Heikkinen after the race, “with the raining and drying. There were a lot of different things. For all of us, we had a tough day—it was tricky to change your setup every time. Even the qualification was a little bit different for everybody. But all in all, it was a great day. Ford continues to dominate the Global RallyCross Championship, Pastrana/RedBull racing, are having a challenging year in 2013 in the 2 car Dodge team, but there is glimmers of hope in there. For Subaru one has to wonder is Global RallyCross tarnishing their outstanding Stage Rally heritage in the USA, a heritage that has seen fans flock to the showrooms for the nearly race ready WRX and STI. While two of the Subaru’s made it to the final in New Hampshire, neither of them finished. No Subaru’s made to the final in Germany in round 3. I expect there will be some hard questions to be answered on the validly of this program for Subaru unless something changes drastically. GRC moves to Bristol Motor Speedway next weekend, track layout will again be interesting, but hopefully they can use a little more infield and less asphalt.